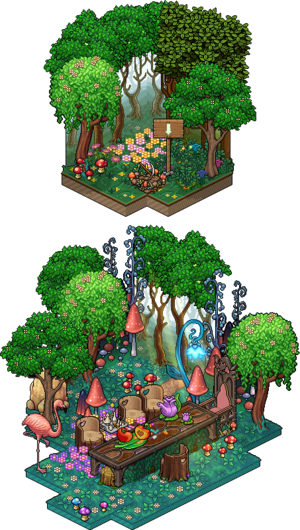 The Teatime in Wonderland Bundle is a Room Bundle released in April 2019 as part of the Fairytale Easter campaign. As the campaign was focused on different fairy tales, this bundle was designed to represent the Mad Hatter's tea party in Alice in Wonderland. It included two rooms; the tea party room itself and an entrance to that room, linked with a Teleporter. The rooms were created by Frission. The bundle was sold for 99 Credits. According to Habbowidgets, 83 Habbos have this badge. This page was last edited on 9 April 2019, at 12:34.